E3 How Much Is Enough? F4 What Can You Do? 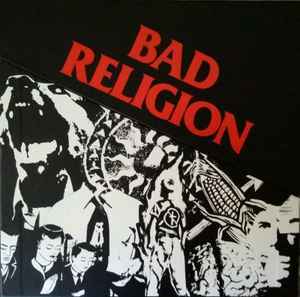 Also known as "30th Anniversary Vinyl Box Set", this contains every full-length Bad Religion studio album. Limited to 3000 copies, all records on red vinyl. Contains the first authorized reissue of "Into The Unknown" since it's original pressing in 1983 and the first vinyl pressing of "Generator" since 1994. "How Could Hell Be Any Worse?" The record comes housed in a standard jacket with a plain white sleeve and with a folded, double-sided insert that contains the lyrics and credits on one side and photos on the other. Pete Finestone & Jay Ziskrout's drum credits are not separated in the liner notes and both their last names are misspelled. The record comes housed in a standard jacket with a plain white inner sleeve and a double-sided insert with lyrics and credits on one side and a band photo on the other. "Chasing The Wild Goose" and "Billy Gnosis" are "Dedicated to Kurt Vonnegut and all those afraid of kissing nothingness on the lips. Peace. BG"
The record comes housed in a standard jacket with a plain white inner sleeve and a single-sided insert that has the lyrics. Recorded at Westbeach Recorders, Hollywood, CA, June 1989. The record comes housed in a standard jacket with a plain white inner sleeve and a double-sided insert with lyrics and credits on one side and a yellow & black reproduction of the cover on the other. Recorded at West Beach Recorders, Hollywood, Calif, May 1990. The record comes housed in a standard jacket with a plain white sleeve and a double-sided insert with lyrics and credits on one-side and artwork on the other. Recorded at Westbeach Recorders, Hollywood, CA, May 1991. Mixed at Brooklyn Studios Hollywood, CA, and Westbeach Recorders. Record comes housed in a standard jacket with a plain white sleeve and a double-sided insert with lyrics on one-side and credits on the other. The record comes housed in a standard jacket with a plain white sleeve and no insert. Mastered at Sterling Sounds, NYC. Recorded in Ithaca, NY at Pyramid Sound and Polypterus Studio. Mixed in Los Angeles, CA at Image Recording. Mastered at The Mastering Lab, Los Angeles. Produced for Alchemedia Productions, Inc. Recorded at Victor's Barn, Kauai, HI. Mixed at Mix This!, Pacific Palisades, CA. Recorded in Los Angeles at Sound City & Westbeach Recorders. The record comes housed in a gatefold jacket with a printed inner sleeve. Lyrics are printed on both the inner gatefold and the inner sleeve. Credits are printed on the inner sleeve. Mixed at Bay 7, Valley Village, CA, Feb. 2004. Mastered at Precision Mastering, Los Angeles, CA. The record comes housed in a standard jacket with a printed inner sleeve. Recorded at Grandmaster Recorders, Ltd. Hollywood, CA. Additional Recording Done at The Evil Pink Room. Mixed at Bay 7, North Hollywood, CA. Recorded & Mixed at Joe's House of Compression. How come when I look up the albums that come in the box set they aren't listed individually ? It would be really helpful knowing what each LP in the box set sells for separately . If anyone hates Into The Unknown, and is okay with breaking up their set, PM me. I want it. A limited number of these came with a Bad Religion flag. Does anyone have info on how many? This has only ever been reprinted as part of this boxset http://www.discogs.com/Bad-Religion-Bad-Religion/release/2624631 so does not require its own page. Any one else receive a set that has a problem with the no substance album>? mine skips ahead countless times... disc is in great shape and my player is tops... I read online someone else had this problem... is this universal?